Dev Tools is an add-on available for FullStory accounts. If you do not currently have the Dev Tools add-on enabled for your account, you can purchase Dev Tools in the app or request a Dev Tools trial. Why am I not seeing any captured Network Request details? In order to begin capturing Network Request details, you will need to enable Ajax Recording under Settings > Recording. What does it mean when I see "Headers Unavailable"? Because the FullStory recording snippet is typically installed in the <head> of a website, FullStory should being recording early during the time it takes for a page to load and should capture Network Request details for most requests. And, by default, FullStory will pull in known-safe data from Request and Response Headers if those Headers were captured in the session recording. However, some requests are expected to take place in the browser before the FullStory snippet loads. For these requests, FullStory Dev Tools may only display partial and inferred data about the Network Request details. 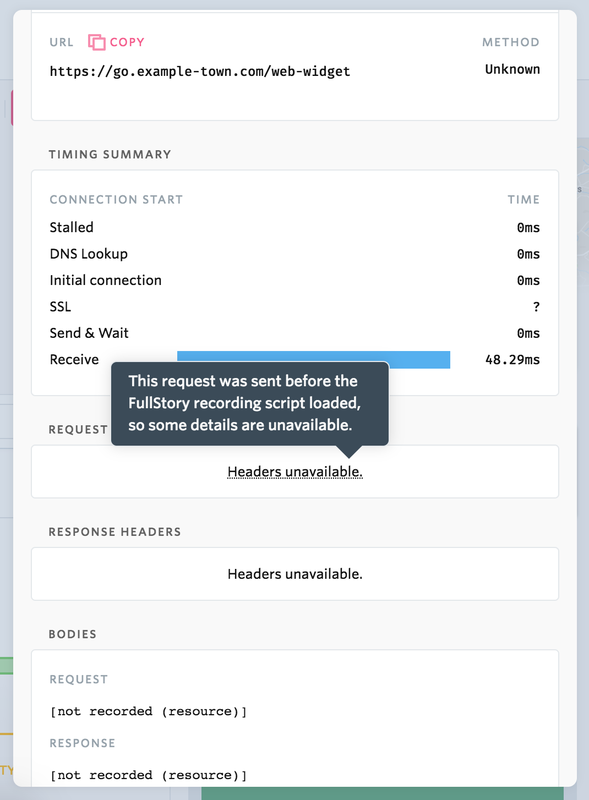 In these cases, when you hover over missing details in the Network Request panel, you should see a message, "This request was sent before the FullStory recording script loaded, so some details are unavailable." If you're loading the FullStory recording snippet in the <head> of your website, it's likely that you don't need to take any action or change your implementation in order to capture more network requests. If you're not loading FullStory in the <head> of your website (which is an option) and if you want to take advantage of everything that Dev Tools has to offer, you may want to consider moving your recording snippet to the <head> of your website, earlier during your page load, so that you can capture more details for more requests. Why can't I see Request or Response Bodies? In order to start capturing Request and Response bodies, you will need to proactively whitelist the requests that you'd like to record in FullStory. This is important because Request/Response bodies can contain sensitive information that you would never want to pass to FullStory for privacy and security reasons. Unlike some other session logging tools that pull in Request/Response bodies by default, FullStory gives you the ability to whitelist only the requests and specific fields that you'd like to record for debugging. You must affirmatively indicate which requests you'd like to capture with Dev Tools and whether you'd like to bring in the full bodies or only specific fields. Learn all about how to whitelist requests here. How is Dev Tools by FullStory different than Chrome DevTools? Dev Tools by FullStory and Chrome DevTools both include features to help you understand the Console and the Network requests, but they have some key differences. Ultimately, the magic of Dev Tools by FullStory is that it gives you the ability to see the Console and Network details in the context of a real customer's experience. Read more about how both Chrome and FullStory developer tools fit into your toolkit and workflows.